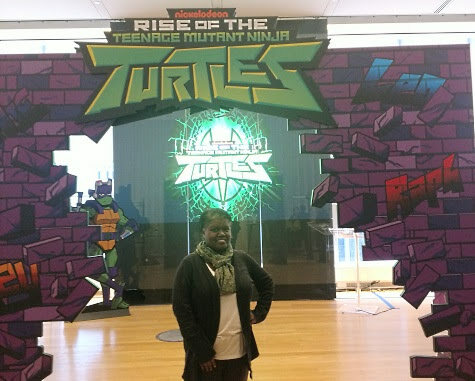 Earlier this year I shared a bit about Rise of the Teenage Mutant Ninja Turtles, the new 26-episode series that reimagines the TMNT iconic series. At that time the news was John Cena will voice Baron Draxum, the villain. 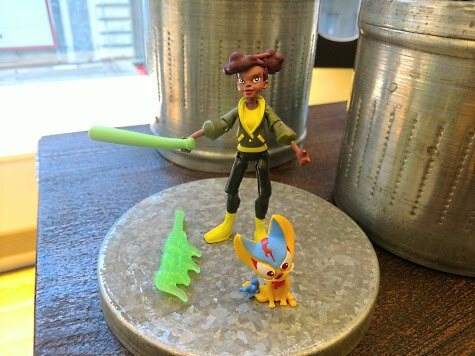 But now I have news about Brandon Mychal Smith, the voice of Mikey, plus a first look at the upcoming toys and products for the series. So what was it like meeting Brandon? He's so fun. 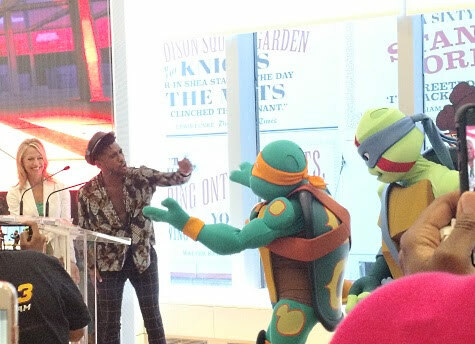 I recorded a bit of video during the presentation so you can hear him talk about voicing Mikey and working with the other TMNT voice actors. 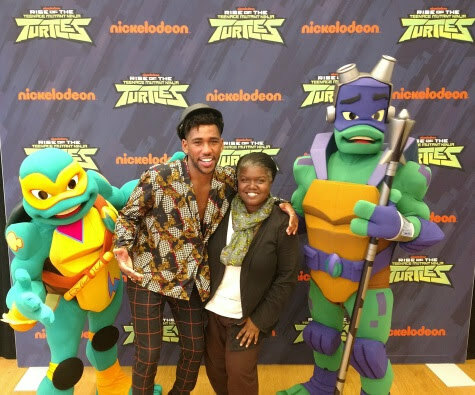 After the presentation (and posing for photos with Brandon), I had to check out the Rise of TMNT toys, which offers so much play fun for kids (and adults, be honest). 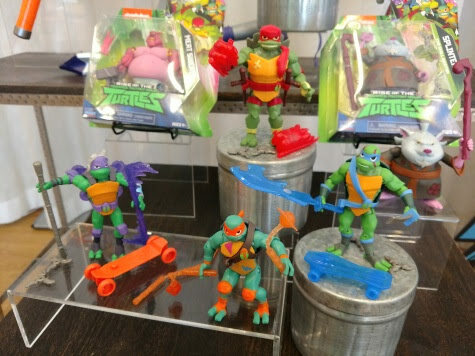 Inspired by Nickelodeon’s brand-new animated series, Rise of the Teenage Mutant Ninja Turtles, Playmates Toys, the longtime master toy licensee for TMNT, previewed a few of the new products coming to shelves in October 2018. Fans can also be part of the SEWER SQUAD! Playmates Toys is also introducing a Pizza Points Loyalty program, where fans can collect and redeem pizza points for awards! Be on the lookout for a secret code in every Rise of the Teenage Mutant Ninja Turtles Playmates Toys package. Kids can collect all of the signature training weapons in the Turtles' arsenal and channel their powers to become their favorite Ninja Turtle! This highly detailed "Rise of the Teenage Mutant Ninja Turtles" action figures are uniquely sculpted and fully articulated, with heights ranging from 3.25” to 5.0". 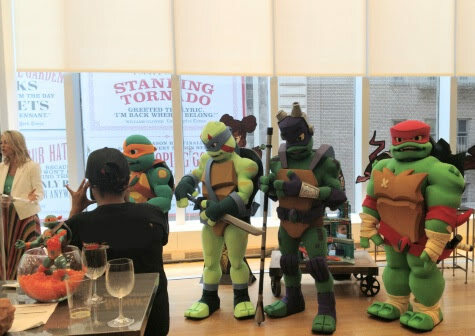 The collection features the four Turtles, as well as new characters Baron Draxum, Meat Sweats and others introduced in the series. Each figure comes with unique translucent accessories, and is compatible with most of the vehicles and playsets in the line. The Turtles rev up on their new Shell Hog motorcycles to take out any villains they encounter. The Turtle Tank is compatible with the Shell Hog vehicles (can be connected to each side of the tank) and even fires them off when the Turtles need to get to the battle fast. Compatible with Rise of the Teenage Mutant Ninja Turtles basic action figures (sold separately). This massive playset is the biggest TMNT action figure playset ever, standing 43" tall! Kids can discover where Splinter and the Turtles live, play and train! This deluxe playset is packed with over 20 features and includes four levels of play and seven rooms for training, kicking back, or taking out the bad guys! Features include: Splinter’s Dojo, Raphael’s Weight Training Room, Leonardo’s Rotating Weapon storage wall, Michelangelo’s arcade, the catapult Basketball hoop, hidden projectile launchers for villain invasions, rotating skateboard ramp, collapsing balcony, and so much more. Rise of the Teenage Mutant Ninja Turtles follows the band of brothers as they discover new powers and encounter a mystical world they never knew existed beneath the streets of New York City. The series stars the voice talent of Omar Miller (Ballers) as Raphael, Ben Schwartz (Parks and Recreation) as Leonardo, Josh Brener (Silicon Valley) as Donatello, Brandon Mychal Smith (You’re The Worst) as Michelangelo, Kat Graham (The Vampire Diaries) as April O’Neil and Eric Bauza (Teenage Mutant Ninja Turtles) as Splinter. Rise of the Teenage Mutant Ninja Turtles reimagines the iconic series and breathes new life into the classic characters, with jagged-shelled Raphael as a snapping turtle, wielding twin tonfas as his weapons; Leonardo as a red-eared slider, using an Odachi sword; Donatello as a soft-shell turtle, sporting a tech-bo staff; and Michelangelo as a box turtle, arming himself with a kusari-fundo. Along for the adventure is the Turtles’ most trusted ally, April O’Neil, a street savvy native New Yorker, and Splinter, father figure and sensei to the Turtles.